Johann Sebastian Bach composed the church cantata Was frag ich nach der Welt (What should I ask of the world) BWV 94 in Leipzig for the ninth Sunday after Trinity and first performed it on 6 August 1724. It is a chorale cantata, based on the hymn by Balthasar Kindermann (1664) on a melody by Ahasverus Fritsch. The cantata is the ninth chorale cantata of Bach's second annual cycle in Leipzig, composed for the Ninth Sunday after Trinity. The prescribed readings for the Sunday were from the Epistle to the Romans, a warning of false gods and consolation in temptation (1 Corinthians 10:6–13), and from the Gospel of Luke, the parable of the Unjust Steward (Luke 16:1–9). The cantata is based on the chorale in eight stanzas of the poet Balthasar Kindermann (1664) on a melody by Ahasverus Fritsch. An unknown poet transformed the chorale to a cantata text, keeping stanzas 1, 3, 5, 7 and 8, expanding 3 and 5 by inserted recitatives, and rewriting 2, 4 and 6 to arias. The cantata text is only generally connected to the readings, referring to the statement in the Gospel "for the children of this world are in their generation wiser than the children of light". The poet expresses turning away from the transient world to Jesus. Bach first performed the cantata on 6 August 1724. The cantata in eight movements is scored for four vocal soloists—soprano, alto, tenor and bass–and a four-part choir, flauto traverso, two oboes, two violins, viola, organ and continuo. Aria (alto): Betörte Welt, betörte Welt! Chorale: Was frag ich nach der Welt! The opening chorus is dominated by the concertante flauto traverso in figurations reminiscent of a flute concerto. 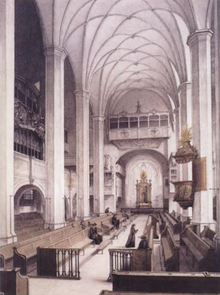 Bach wrote virtuoso music for flute here for the first time in a cantata for Leipzig. Probably an excellent flute player was available. Bach seems to have written again for him in Herr Christ, der einge Gottessohn, BWV 96. Two themes of the opening ritornello of twelve measures, one for flute, the other for the strings and oboes, are derived from the melody of the hymn "O Gott, du frommer Gott" (1648). The chorale is sung by the soprano. The lively music in D major seems to represent the "world" rather than its negation. In the bass aria with continuo, comparing the world to "haze and shadow", tumbling motives illustrate vanishing, falling and breaking, whereas long held notes speak of stability ("besteht"). In the third movement the tenor sings the chorale in rich ornamentation, the accompaniment of two oboes and continuo is similar to the (later) Er ist auf Erden kommen arm in the Christmas Oratorio, #7 of Part I. The following alto aria, calling the world a "snare and false pretense", is dominated again by the flute. The arias for tenor and soprano are set in dance rhythms, Pastorale and Bourrée, describing the "world" rather than disgust of it. The cantata is concluded by the last two stanzas of the chorale in a four-part setting. ^ a b c Dellal, Pamela. "BWV 94 – "Was frag ich nach der Welt"". Emmanuel Music. Retrieved 22 July 2014. ^ a b c d Dürr, Alfred (1981). Die Kantaten von Johann Sebastian Bach (in German). 1 (4 ed.). Deutscher Taschenbuchverlag. pp. 390–395. ISBN 3-423-04080-7. ^ a b Cookson, Michael (2004). "Johann Sebastian Bach (1685–1750) Cantata … "Was frag ich nach der Welt", BWV 94". musicweb-international.com. Retrieved 22 July 2010. ^ a b Freeman-Attwood, Jonathan (2003). "Bach: Cantatas Vol 22 / Suzuki, Bach Collegium Japan". ArkivMusic.com. Retrieved 22 July 2010. This page was last edited on 11 August 2018, at 11:20 (UTC).